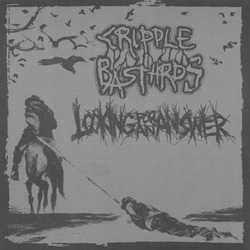 RFL RECORDS: CRIPPLE BASTARDS / LOOKING FOR AN ANSWER SPLIT 6" OUT NOW! CRIPPLE BASTARDS / LOOKING FOR AN ANSWER SPLIT 6" OUT NOW! CB's side includes 2 completely unreleased songs recorded in 2003 between "Desperately insensitive" and the split EP with Eyehategod. Hyper-speeded covers of IMPULSE MANSLAUGHTER and NEGATIVE FX, showing how CB are able to crossover their peculiar Hate/Grind assault with 80s fast HC influences. On the flipside 2 covers as well (NAPALM DEATH and RUIDO DE RABIA), delivered by Spain's Grindcore heavyweights Looking For An Answer in the furious old school Grind vein. A highly collectable 6" slab of devastating speed, rage and distortion! DIRECT MAILORDER GETS COLOR VINYL!